1.The whole rig is very compact, which requires small installation space due to it's high integration. 2. The heavy-duty and self-propelled chassis: 8x6,10x8,12x8,14x8,14x12,16x12 and hydraulic steering system is utilized respectively, which ensures the drilling rig good drive performance, cross-country capability and lateral stability and credibility of every component. 3. the reasonable assembly of the engine and the transmission box can ensure high driving efficiency and working reliability. Draw works and rotary table can be driven by electrical power. 4. the main brake could be disc brake or band brake, and the auxiliary brake could be air brake-water cooling-thrust disc brake or water brake. 5. the rotary table transmission box provides forward-reverse shift, which can be suitable for positive and negative DP rotary operations, and the anti-torque releasing device can be used to make the DP deformation force released safely. 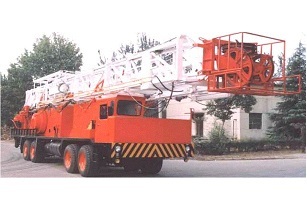 6. the mast, which is front-open and double-section type with an inclination angle is an erective double-section type, can be raised up or laid down and telescoped hydraulically. 7. the drill floor is twin-body telescoping type or with parallelogram structure, which is convenient for easy hoist and transportation. The height of the drill floor can be designed and produced in accordance with the clients requirements. 8. the perfect configurations of the solid control system, well control system, hi-pressure manifold system, generator house, engine pump house, doghouse and other auxiliary facilities can meet users different requirements.